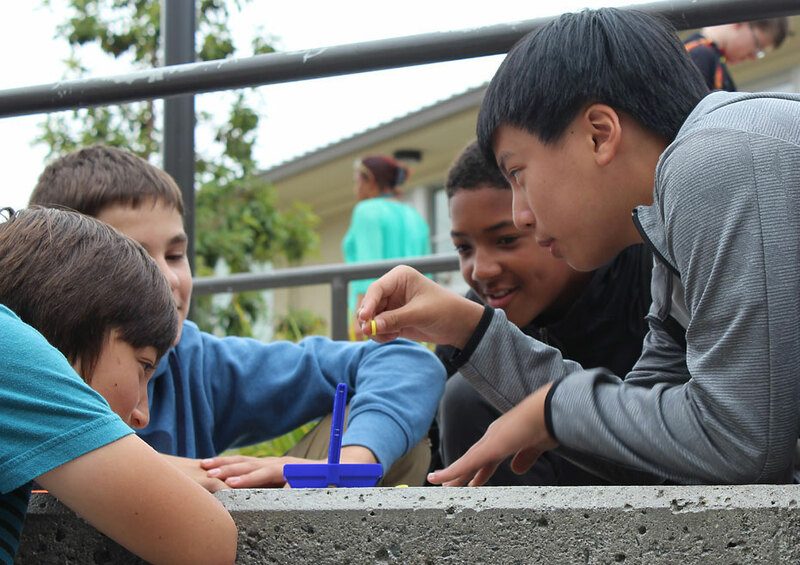 With no cell phones to toy with, middle school students play a game after lunch at Korematsu Middle School in El Cerrito. 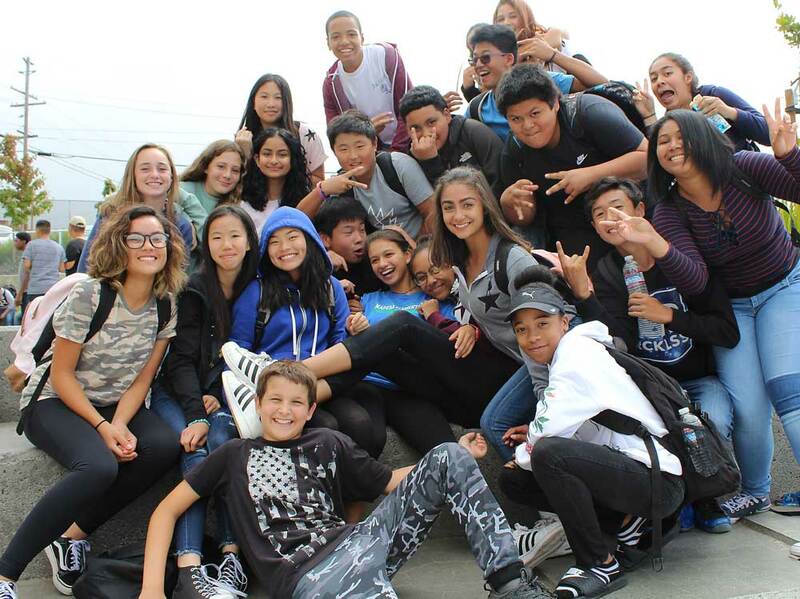 Three hundred and fifty 8th-graders stood around empty-handed after lunch on the courtyard at Fred Korematsu Middle School last week, forming a throw-back tableau that represented one school’s attempt to revive the art of the face-to-face conversation. No earbuds. No head phones. No music. No photos. No bent necks. No phones. In the first hour of the first day of the school year, the staff broke the news to 718 7th- and 8th-graders that they would no longer be allowed to use their cell phones during free time. The decision to restrict cell phone use came after an experiment with laissez-faire monitoring ran amok, said Matthew Burnham, the youngish, chatty principal of Korematsu Middle School in El Cerrito in the East Bay Area. Harsh comments posted on Snapchat and Instagram spread agitation among some students — “mostly it was trash-talking back and forth,” Burnham said. A couple of distraught parents infiltrated social media to stop what was going on with their children, a “bad choice,” said school psychologist Kathleen Hazard. Seventh-grade English teacher Sarah La Due caught a student with a cell phone wedged inside a book in class, pretending to read. And the tops of students’ heads were mostly what Burnham saw at lunch. “You’d see 20 kids sitting at a table and they’re all looking down at their phones,” he said. “I’d get on the microphone and say, ‘You need to talk to the person next to you — at least say hi, how was your day,'” he said. What’s missing from this photo of students at Korematsu Middle School? Cell phones. Cell phones are bedeviling schools across the country as high percentages of high school and middle school students have smart phones and at least some students use them, surreptitiously or openly, to socialize during the day. Burnham estimates 95 percent of his students have a cell phone, meaning 618 cell phones are on campus, and most of them are smart phones with ready access to all manner of distractions. Daytime texting, social media commenting and game-playing create a web of unseen personal interactions, some positive, some not, leaving adults without a clue even as they work to help students develop their social and emotional skills. And new research is raising alarms that preteens and teenagers increasingly are foregoing in-person time with friends in favor of time on social media and are more unhappy because of it. Most schools don’t allow students to be on their phones during class, unless teachers specifically ask students to wake up their devices to research a topic, photograph a homework assignment or record audio or video; students who don’t have phones are directed to laptops. Some districts, including the Los Angeles Unified School District, the largest in the state, already have policies forbidding cell phones during lunch and passing periods. How thoroughly the policy is enforced varies by school, students say; some teachers tire of confiscating phones. And if students are allowed to go off-campus during lunch, one can assume all bets are off. “I think the majority of schools are overwhelmed,” said Liz Kolb, a clinical assistant education professor at the University of Michigan and the author of the book “Learning First, Technology Second: The Educator’s Guide to Designing Authentic Lessons.” She suggests schools post hallway reminders for students to get off their devices and talk to each other. “Positive mobile mental health” conversations should begin in late elementary school, she said. “They need to know that if you’re on your phone more than two hours a day, it creates the potential for depression and anxiety,” she said, referencing research including this study on social isolation and this one on Facebook use. No one tracks the cell phone policies schools have or how well they are enforced, but some schools are starting to help students step away from their phones and hang out in real life. This year, Corona del Mar Middle School in the Newport-Mesa Unified School District created a “cell phone free zone” around the lunch area in an effort to get students talking. “We’re giving students permission to put it away,” said Annette Franco, a spokeswoman for Newport-Mesa Unified. “So many times it’s used as a barrier to socializing.” In the Glendale Unified School District, at least two middle schools have done what Korematsu has begun: require cell phones to be off and out of sight during lunch, said Kristine Nam, a spokeswoman for Glendale Unified. And about 500 school parent associations in California, and more than 5,000 schools across the U.S., have shown the documentary “Screenagers: Growing Up in the Digital Age.” The film tracks Delaney Ruston, a Seattle doctor, the producer of “Screenagers” and an alumna of Berkeley High, as she talks with her children, interviews experts and navigates the use of cell phones and video games. The constant pull of the device begins, Ruston said, with the brain’s hard-wired interest in gathering new information. Each ping on the phone releases a jolt of dopamine, a brain chemical connected to pleasure. Dopamine can be hard to resist and a distracted brain can become the normal state, without our awareness. One study by researchers at the University of Texas and UC San Diego found the presence of a cell phone — even if it’s face down on the desk or in a bag, on silent — limited a person’s thinking and memory. Another study, published by a journal of the London School of Economics and Political Science, found that student test scores rose in four schools that banned cell phones, with most of the rise occurring among the lowest-achieving students. Jean Twenge, a psychology professor at San Diego State University, wrote in a September article in The Atlantic that the rise of cell phones and social media has created a generation that spends less time with friends and more time alone in their rooms on their phones. Citing data from The Monitoring the Future survey, funded by the National Institute on Drug Abuse and designed to be nationally representative, Twenge said that teenagers who spend more time online than they do with their friends are the most likely to report being lonely and feeling left out. So far, said Hazard, the school psychologist, she has not heard of students reeling from hurtful remarks on social media, though she has helped some students sort through social media thoughtlessness over the summer. Grace Wolfman, 12, who was hanging out with three friends on the Korematsu grounds after school, said cell phone troubles come when students try to mimic what they see on TV — a world she described as one of light-skinned, beautiful people upset because they don’t have a million followers on social media. “All the TV shows have so much drama,” she said. Seventh grader Janeil Guada, 12, thought the no-cell-phones-at-lunch policy made sense, given the way phones interrupt and demand attention. “It would be nice to have a phone that wasn’t so addictive,” he said. I disagree, this will not change anything. 1. Over half the population of Korematsu qualifies for free or reduced lunch; yet 95% of them have cell phones. So the parents can afford the monthly cell phone charges, but they can’t afford food? 2. “They need to provide us with something else to do,” the student in the article said. Really?? They can’t figure out how to spend 20-30 minutes without an adult providing entertainment? No cell phones at school is the first step to helping students learn critical social skills that will help them succeed at school, work and in life. This is a great article. Thank you. Cell phones are simply another obstacle in the way of adults controlling the lives of children. It’s hard enough to control kids who resent having their time/lives wasted by temporarily memorizing the trivia mandated by the adults. But when you add a pocket sized super-computer (which not only distracts them from their busy-work, but makes said busy-work even more pointless) into the mix, well, that makes things even more inconvenient for the adults. Despite the good people who work at schools, schools has always existed much, much more for the convenience of adults than for the benefit of kids, no matter how much the adults have convinced themselves otherwise. So glad to hear the tide is turning on this subject, but still many schools are behind on this issue and still allowing cell phones during the school day and at lunch. If school is truly a place of learning (our children’s job! ), then there is no place for phones. Let’s get real, kids use phones 99% of the time for entertainment purposes, not a tool for speaking to another person or for learning. Phones (smartphones) are a constant distraction, a crutch, a time waster and a deterrent from learning. Kids need less time on screens, not more time on screens. Hope the educators, administrators and parents take heed and make the necessary changes at school (and at home) for the future of all our kids. I read this on my cell phone while in line at Starbucks. We are having a conversation right here. I don’t understand this article. If schools cannot set a clear policy to eliminate the distraction of cell phones, a simple, clearcut and solveable problem, when it is entirely withn their power to do so, what chance do schools have to close the achievement gap? We turn everything into an emotional morass of indecision and, as a result, we are left unable to tackle even the simplest of problems. This year we rolled out a distraction-free school day for our students and it has transformed the school climate and culture. We received a gift from a local company called Yondr. Our students enter each morning, their 1st period teacher hands them a Yondr pouch, they place the phone in the pouch and lock it. They do not have access to their phones until the end of the school day. What has happened has been amazing. Teachers do not have to monitor their students who used to text and be on social media during class. Nutrition break and lunch are filled with noise because students are talking to each other and playing sports, cards, and other games. Their postures have improved since they do not have access to their phones during unstructured times such as passing period. The impact has been astonishing. Our referral and suspension rates for bullying and fighting have also declined. I challenge all instructional leaders to imagine your school and day without cell phones. Please contact me to learn more. Here is the crux of the matter: How did you get your administration to be on board and supportive of this? Also, what does your school/district do about ear buds that can easily connected to chromes to listen to music and video watching on computers? Chromes and ear buds are the counterpart to phones.